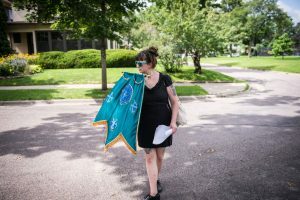 Lacey will create a satin banner, stretching the width of her street, to act as a gateway or healing portal to pass under. It will have protective symbols sewn on, printed as cyanotypes, and will incorporate braided hairwork. It will also have something at ground level for people to take with them as talismans.